Nothing dates a home faster than an old fashioned, grubby bathroom. Your bathroom is where you spend time relaxing, and it’s often one of the first things a potential buyer will look at, so it’s important that your bathroom is modern and stylish. Take a few moments to read our guide to bathroom suites to find out which style is best for your home. Choosing the right style of bathroom suite is essential if you want your bathroom to look great as well as being functional! If you live in a period Victorian house, you might want your bathroom to be in keeping with the rest of your home. This doesn’t mean that it has to look dated, but why not consider adding some traditional design features, such as a claw foot tub or traditional style taps. If you live in a modern high-rise apartment in the city, your bathroom should be equally awe-inspiring, with chrome and glass fittings, LED lighting and modern shower enclosure and bath. The cost of installing a new bathroom in your home varies greatly, depending on the style of bathroom you choose. By opting to shop online for bathroom suites, you can often make significant savings, and if you’re lucky enough to know a local plumber or bathroom installer who can fit your bathroom for you at a reduced rate, you’ll save even more money! Most bathroom showrooms offer a full service from purchase through to installation and aftercare, but be aware that you will pay more for a service like this. By choosing to design a bespoke bathroom, you’ll pay more, but will benefit from the freedom of designing your perfect bathroom! Whether to install a bath or shower in your bathroom is often a confusing question for most people. By thinking about your lifestyle and preferences, you can decide whether to install both or just one. Many people enjoy the convenience of a morning shower, but love sinking into a hot bubble bath to relax, so opt for an over-bath shower or separate shower enclosure to solve the problem! If your bathroom is very small and space is limited, you may have to make the difficult decision to install either a bath or a shower. In these instances, a shower is usually the more practical choice, and will add value when you come to sell your home – many buyers won’t consider purchasing a property which doesn’t already have a shower installed. 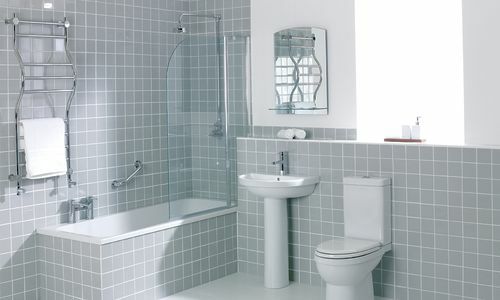 Whichever style of bathroom suite you choose for your home, make sure that it is white! Coloured suites are very dated and whilst they were once popular, today they don’t appeal to most people.